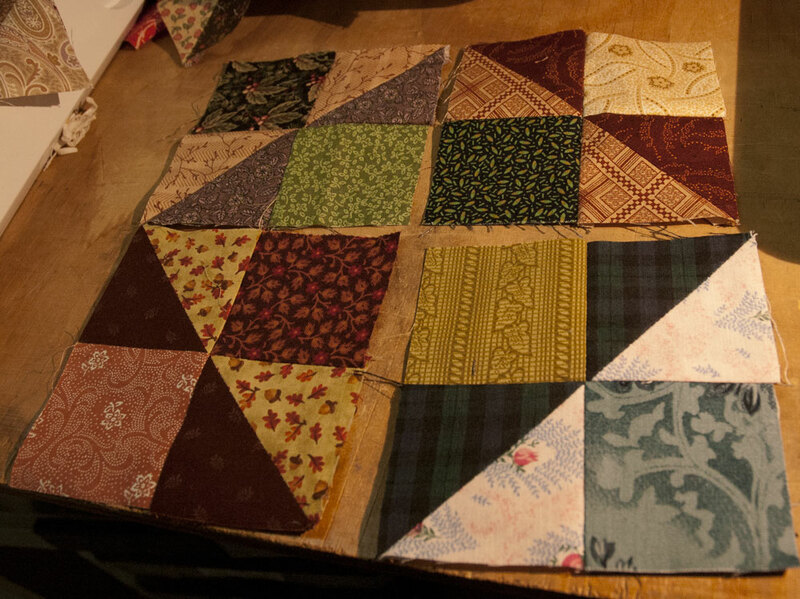 I've made more progress on these blocks, I'm up to 36 now, I've sewn more since I took this photo. They go together really quickly once the HST are made. I've been making the triangles in sets of two, and making lots of these units. 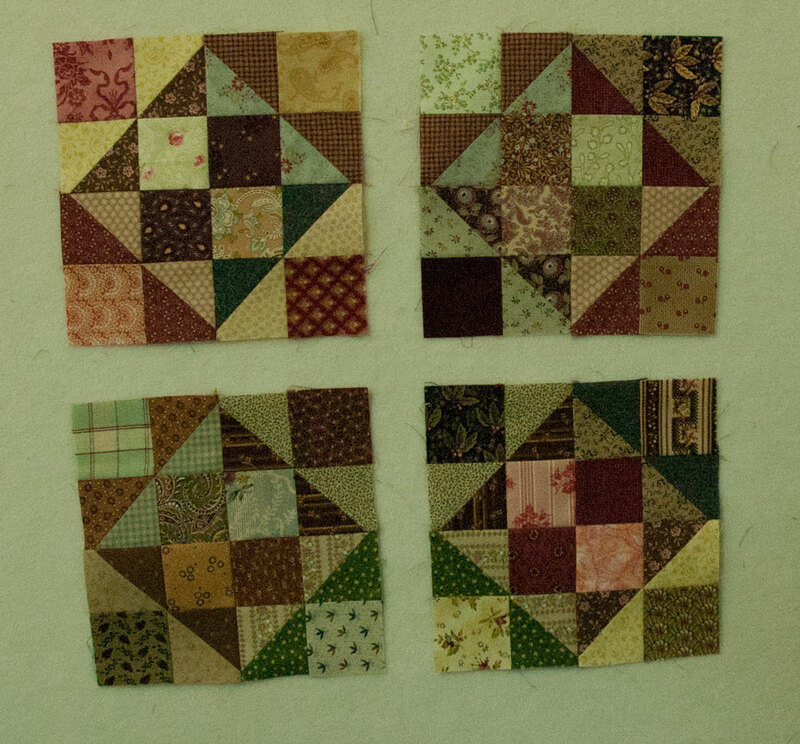 The block is just four of these, rotated so that the lights and darks alternate. 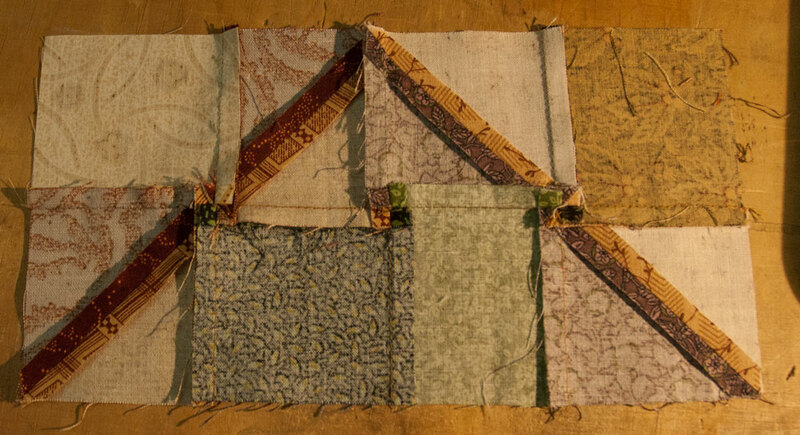 To make sure the seam allowances all nest nest together, in the blocks themselves and in adjoining blocks, I always lay out the pieces for each unit the same way, with the dark square in the top left corner. 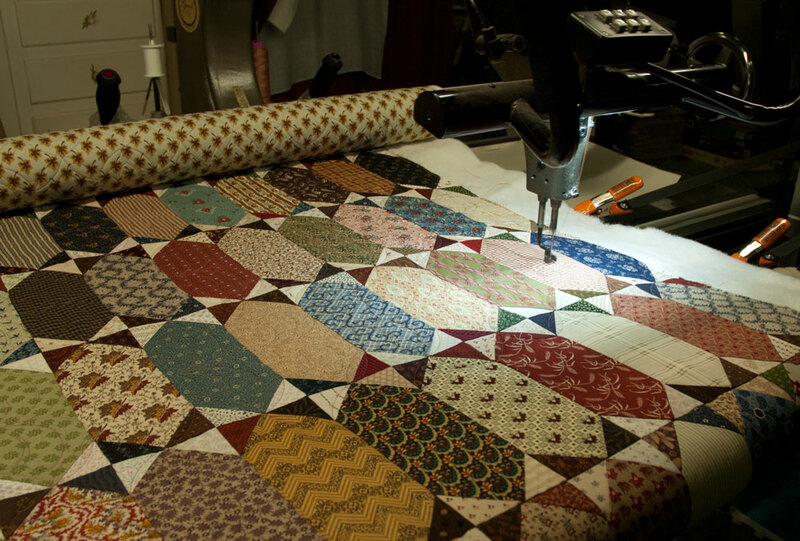 When I press the seam allowances I press the first seams towards the squares, and twirl the centre insection once the two halves are sewn together. 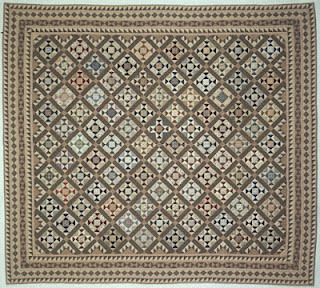 It doesn't mattern which way these units are rotated, the seam intersections will nest together, so long as you make them all identically. Four units make a block. 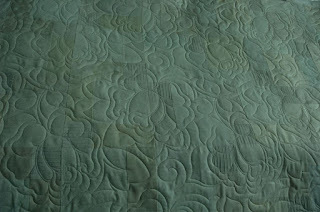 You can see how the seam allowances swirl at all the intersections. 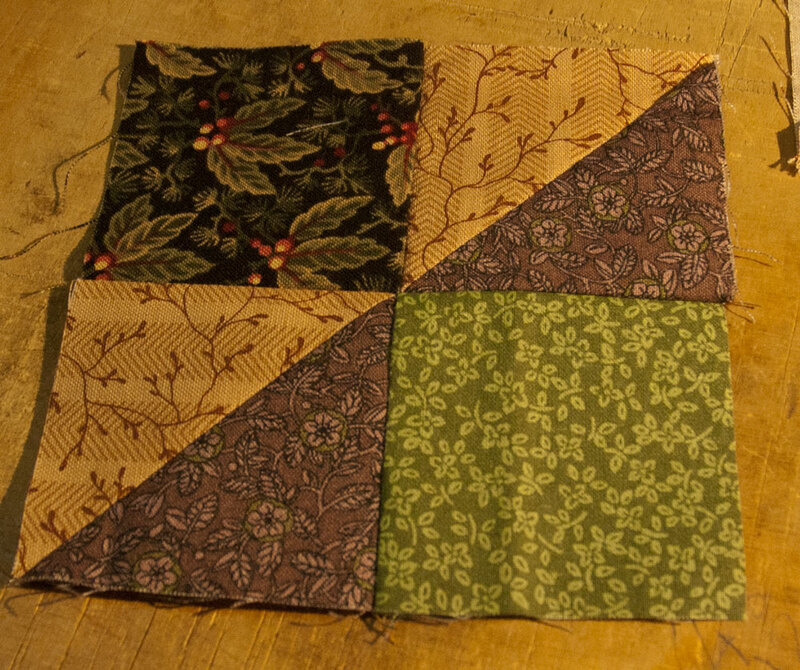 The final block looks like this on the back; I like to press the seams on my HSTs open, but this pressing scheme works even if they are ironed to one side. 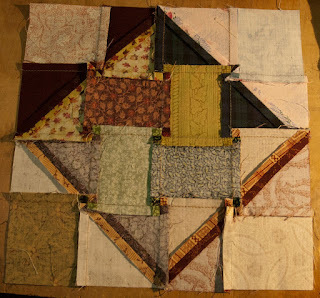 I love it when blocks go together nicely, I hate having to mash seam allowances together in a big lump. 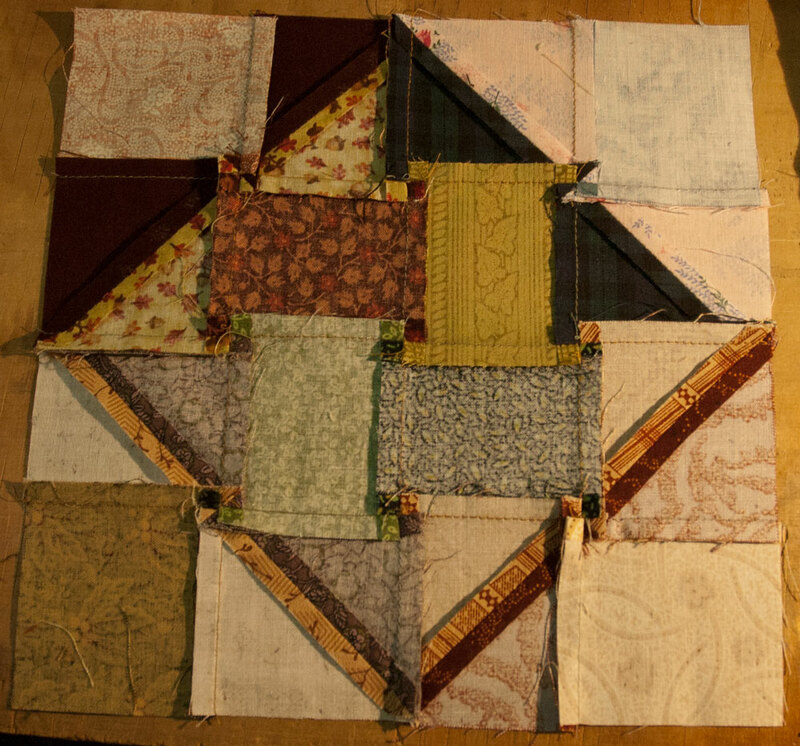 Once I put the blocks together I will be dealing with pinwheels formed by the intersections of all those triangles. 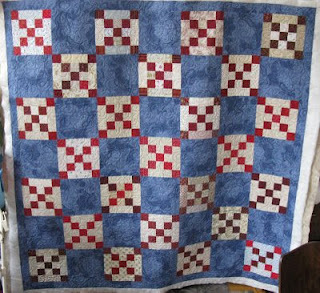 I'm not going to worry too much about making them meet exactly; I don't have time to be unpicking things on a scrap quilt like this. I had a productive weekend, certainly dealt with that pesky drawer of strips! There's a few strips left, that I know I want to use in other projects, but all the rest was chopped up and will become leader-enders for the forseeable future. It's a good feeling to know those bits that have lingered on for years are finally going to be used for something. I cut them into 8.5" rectangles, and they will be sewn into Roman Stripe blocks; there aren't enough to make a quilt, but they can bide their time in the block drawer. I'm sure I will collect more dull fabrics to add to them. or they can be sashing for small blocks; if I wanted to I could make Rail Fence blocks with them. I'll decide later, but for now, they are out of the drawer. 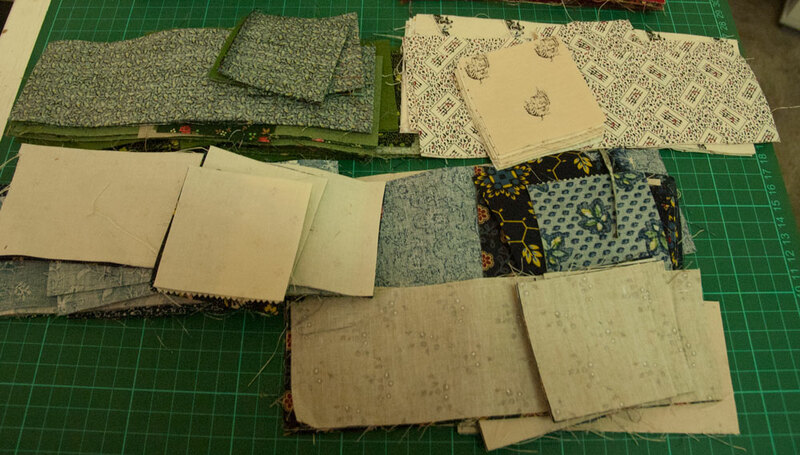 I consulted Mereth's Tutorial for cutting 9 patches, and then cut up all my dark blue, dark green and shirting scraps into 9 patches. 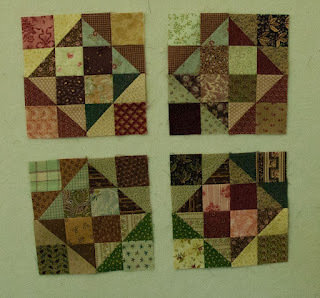 I know I will find a setting for these blocks later, I can use them as simple nine-patches, or build a more complex block around them. They will make great leader-enders while I decide what to do next. and I have plans for a quilt that Mereth designed, Doors and Windows. (Instrutions here) It's a lovely simple block, I'm looking forward to combining the colours. Now I just have to tackle the 1.5" strip drawer! I've had a little blogging holiday; in truth I think I was sulking a little bit because my internet connection is so unreliable, and it was so infuriating trying to update the blog when a photo took two hours to load. If it loaded at all. However, things have been a little better lately, so I will give it another go. 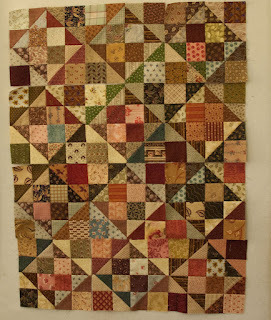 I've been busy with the usual round of postie work and quilting and designing. I haven't even been in my sewing room much, too distracted by piles of fleece. 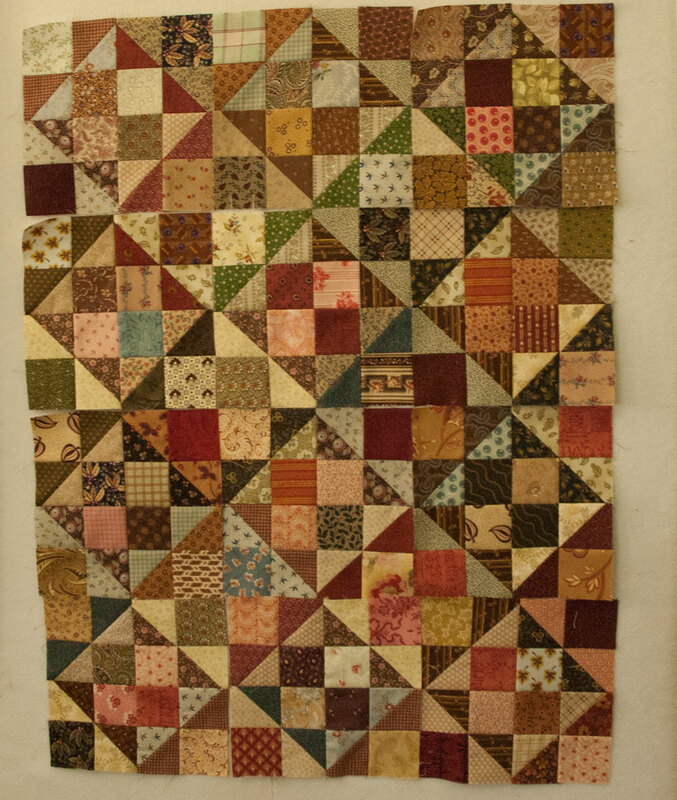 One was 30 years old, bought for me by my mum before I moved to Queensland in 1981. 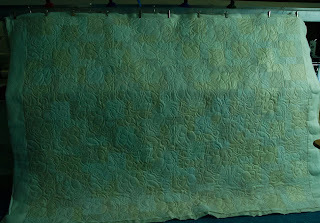 All these years I have treasured it; I didn't have a wheel in Queensland, so I couldn't spin it there, and anyway, it was too hot and humid to even think of working with fleece. It's been bundled up all those years, and I didn't once unpack it completely, knowing I would tangle it up. 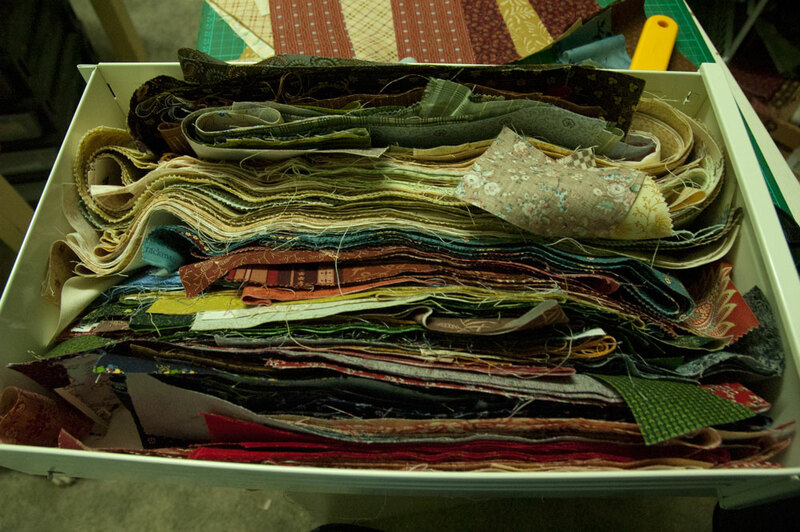 But I finally decided the time had come to deal with it, so I dumped it all out on the floor and started to sort it. It's terribly 'crispy'; the lanolin has hardened, and the locks feel quite dry and brittle; I wasn't even sure that it was worth spinning, but I had to give it a try. 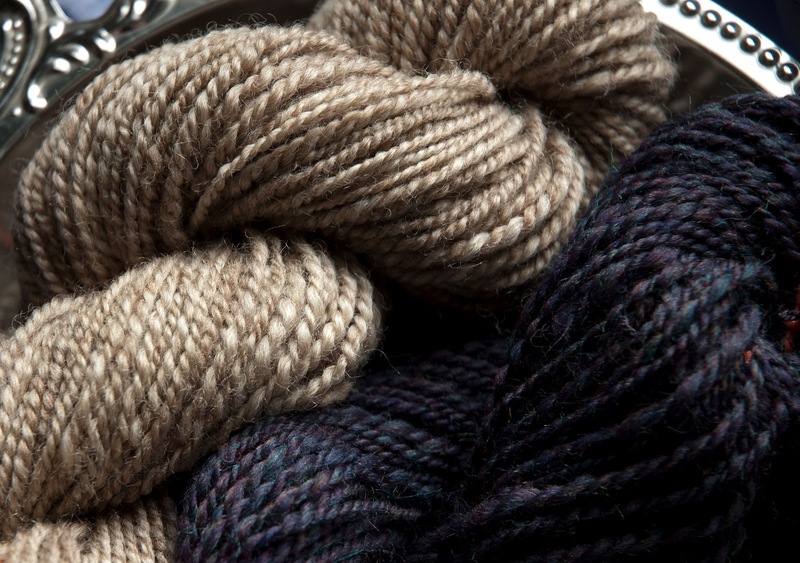 I've been handwashing the locks a little at a time, then combing them and spinning them into a sockweight yarn. 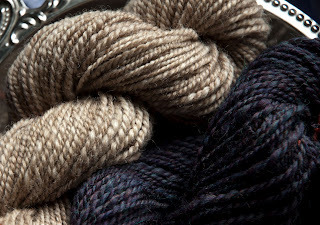 Amazingly, the fibre is still so strong that almost none of it breaks in the combing process, and the resulting yarn is lovely. All these years I thought it was just dark grey, and it turns out there was a beautiful light grey patch hiding inside. The yarn is still a bit uneven, but I choose to see that as 'charming', rather than a fault. I've also been spinning up some blue roving I purchased a couple of years ago. It's so nice to be able to spin it without any preparation, and I do love the colours. 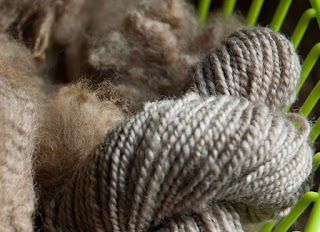 But somehow I love raw fleece so much more, even with the lengthy sorting, washing and combing time. I just love taking something so basic and turning it into useable yarn. It satisfies the peasant in me. 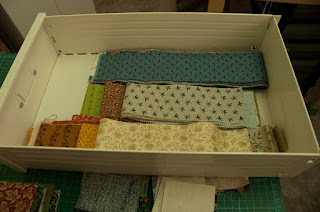 and today I want to sew more blocks, and then tackle this drawer full of 2.5" strips. I need to see the back of this lot, I can't even get it back in the cabinet it's so full. So it will be a major cutting day today, and we'll see if there's any progress to report tomorrow. 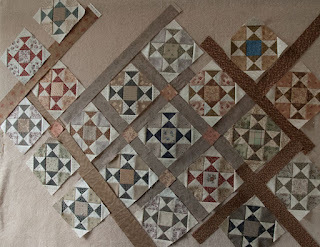 I think I've decided on the sashing for the blocks, so I'll get started on putting them together soon, and make some trial blocks for the borders and setting triangles. I don't normally make quilts that require quite so much piecing, but it's a nice change to take some time and trouble over a project. 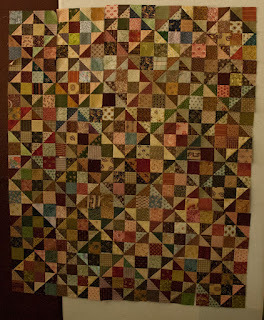 I'm actually quilting something of my own at last, the Honeycomb quilt from last year. It's so satisfying to see it getting finished; it's off to be photographed after this, I'll have to say good bye to it for a while. My home internet is still non-existent, so there won't be much blogging in my future; it has to wait till I go to work at the Hall, and then I'm busy doing 5 or 6 other things. Oh well, I don't have time to be bored. 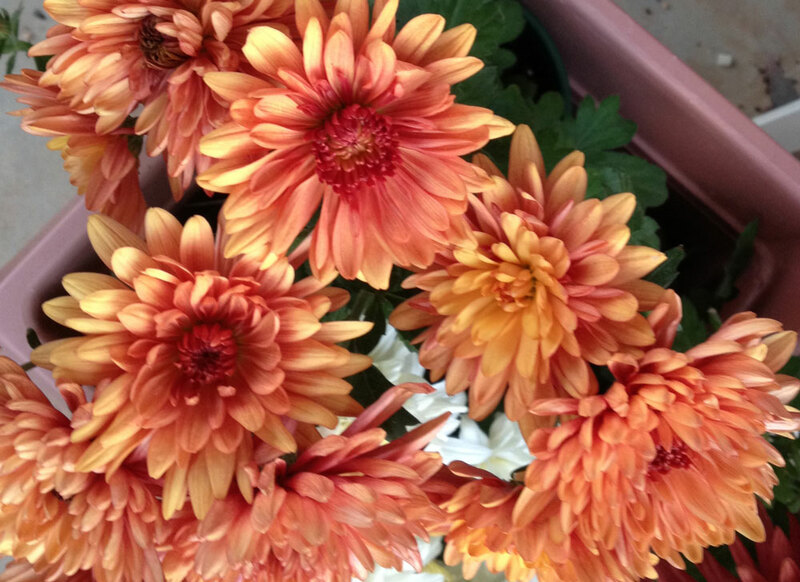 The crysanthemums just keep getting better and better, those colours are amazing. It makes me happy just to look at them. I'm at that annoying stage of needing to choose the sashing for these blocks, and not knowing exactly what I want. 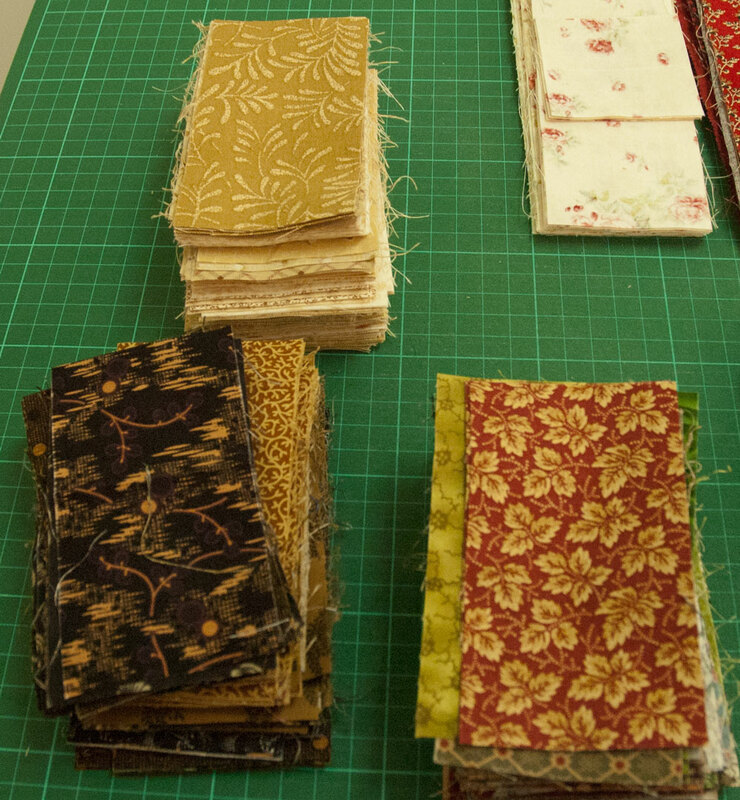 I must have tried 20 different fabrics, and none of them jump out and say 'I'm the ONE!' I'll just have to be patient and keep trying, because somewhere along the line I'll find the perfect colour and print, and the quilt will be the better for it. It's just irritating not to be able to wrap it all up right now. For a bit of easy sewing I've been making these scrap blocks from my mountains of 2.5" scraps. They are fun and easy, and good leader enders. 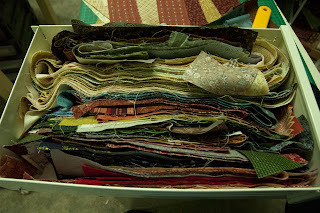 I'm getting sick of the same scraps showing up again and again though, so I think I'll empty them all into a bag and sell them on Ebay. 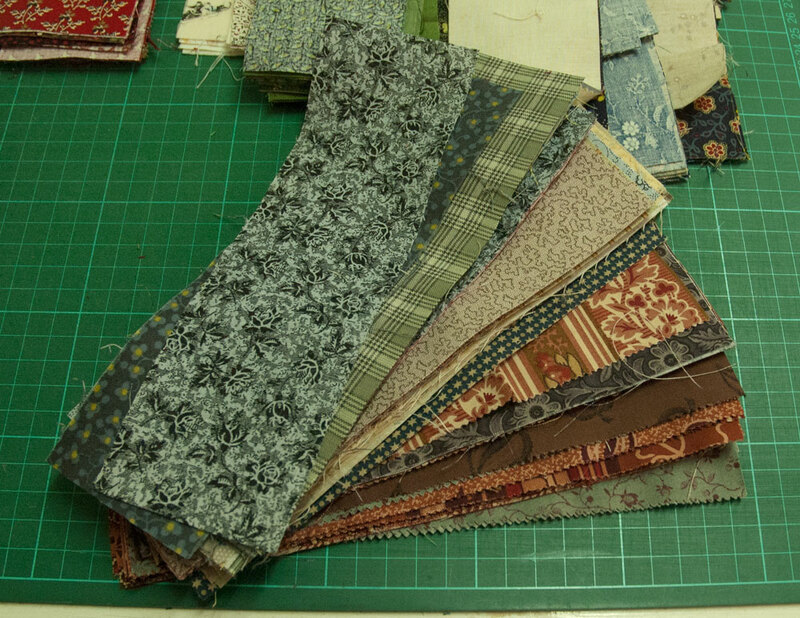 Then I can start again with new fabric. Is that a weird way to think? It's my favourite time of year, nearly Mother's Day! That means crysanthemums in the shops, and I've already added 7 to my collection. I have about 12 blooming from the ones I bought last year, so it's Flower City here. I love them so much, I can't resist the new ones. 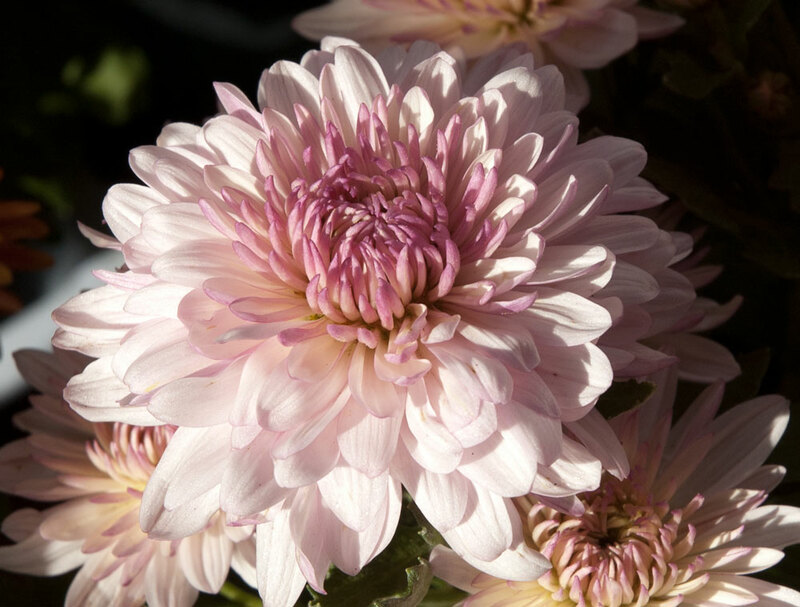 Next on my agenda is to build a garden bed so I can plant them all out, and they can grow as big as they like instead of being confined to pots. 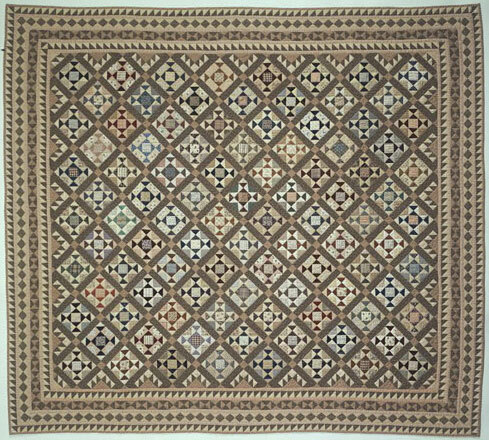 The last customer quilt was so pale, the one on the frame now is exactly the opposite. 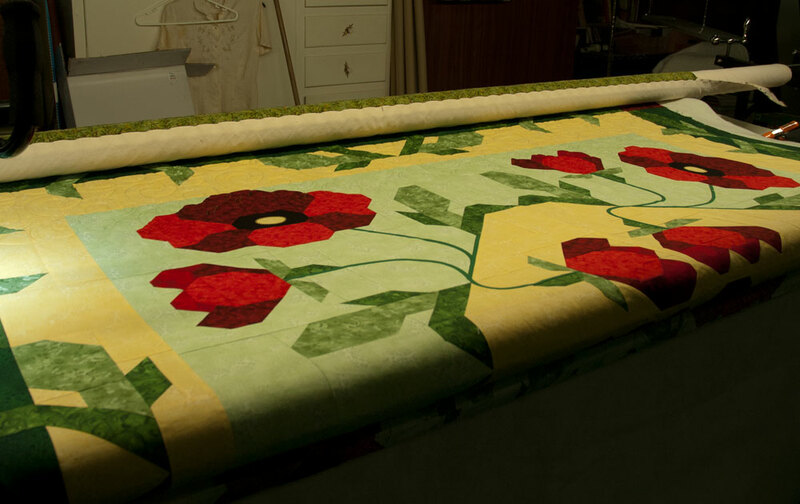 What an explosion of colour in this poppy quilt, it's gorgeous. I'm just glad the owner didn't want custom, I have no idea what I'd do on this. I'm still awfully busy, so it's great to be able to set a panto stitching and then get back to work on the computer. I do like being able to multi-task like that, but my idea of luxury right now is being able to concentrate on one thing only, until it's done. 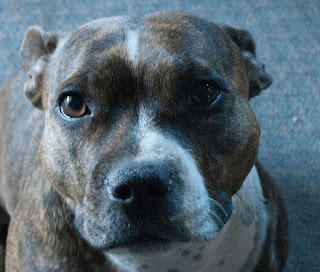 Actually, there is one thing I can do on it's own, Dolly reminds me; "Take me for a Walk!" I've been working very hard lately, and decided that today is a day off. 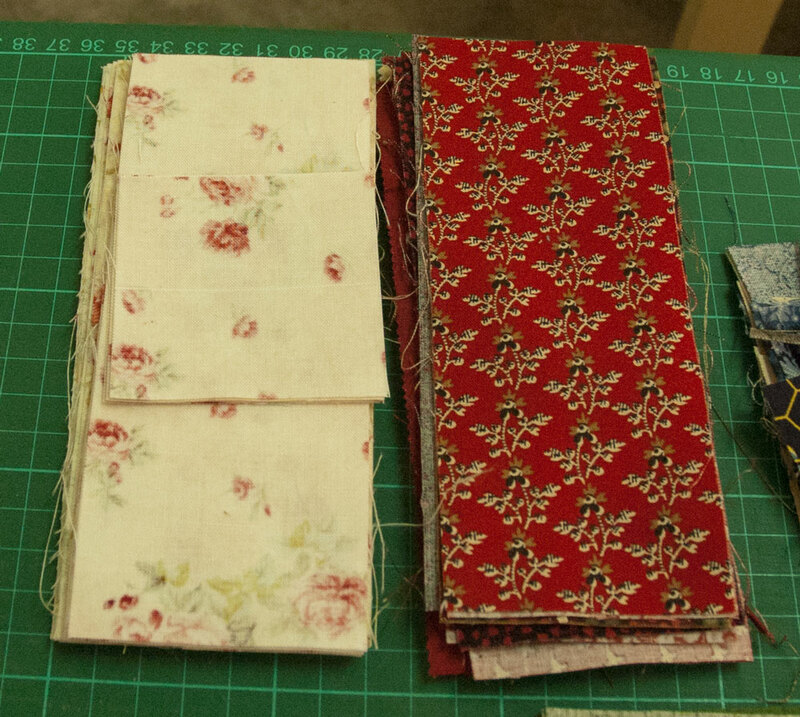 I'm going to potter in my sewing room and do whatever I fancy. I'll put something on the TV this afternoon, and stay in my sewing room doing whatever I want. I've earnt a little time to play. 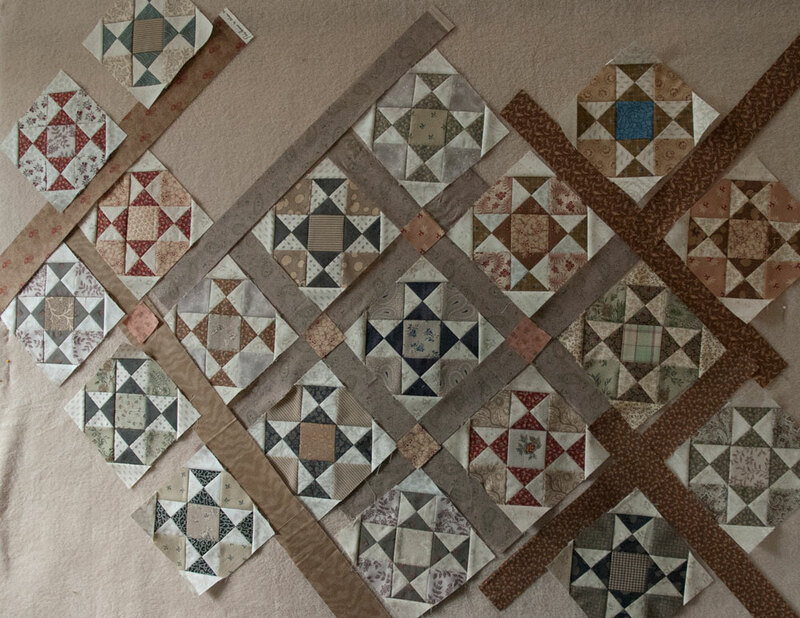 I don't think I showed a picture of the inspiration for my current quilt; I know I photographed it from one of my books, but I can't remember which one, so I'll have to track that down. 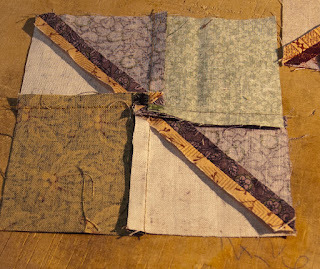 Those multiple borders intruiged me, and I think I will add them to my quilt. It will take a lot of work, but it will be amazing when finished. I'm leaning towards a dull brown sashing instead of the grey I originally had in mind, but I don't have to make a decision any time soon. There are still 20 blocks to make, and then those setting triangles around the edge. I'll be working on this for a while yet. I spent my spare moments this week quilting customer quilts, when I wasn't working on the computer; I desperately want to quilt something of my own, so that's what I'll be doing next week. 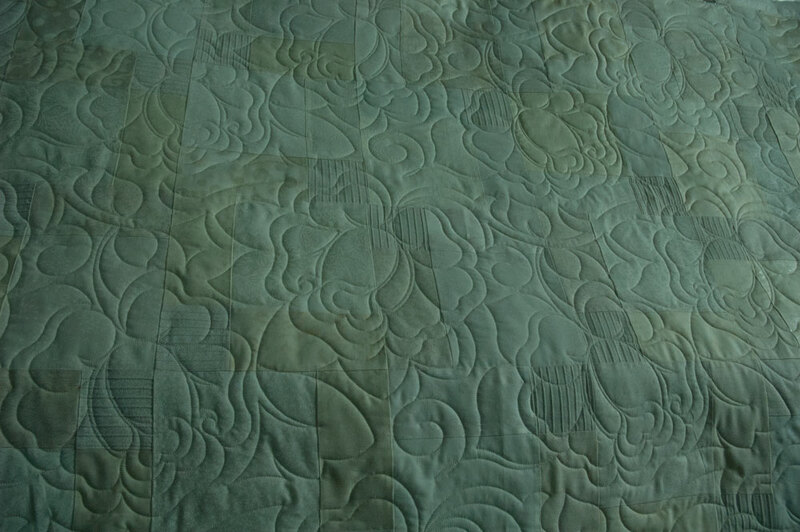 This cream Disappearing Ninepatch was made for the customer's elderly mother; it's so subtle and sophisticated, it was fun to quilt, and watch the pattern coming to life on the pale fabrics. It's a panto of mine called Avon Rose, I'm so happy with how it stitched out. Terribly hard to photograph, but lovely in real life.